Updated 12-10-14 with new FAQ question. Many Notaries have questions about the new California certificate wording changes effective January 1, 2015. NNA Vice President of Legislative Affairs Bill Anderson answers seven of the most commonly asked questions below. I have certificates with the older wording. May I continue to use the older wording after January 1? No, you may not continue to use certificates without the new consumer notice in a box at the top of the certificate after January 1. The statute requires that you use certificates exactly in the words presented in the law. If you use certificates without the required wording, you will be out of compliance with the law. I have great handwriting. May I write in the new required wording on my old CA certificates? It depends. Technically, you could write the wording of the new consumer notice in a box at the top of the certificate if there is room and the consumer notice is legible. If you deal with documents that come with certificate wording, there may not be room for the notice, and you’ll never know until you see the document. Remember, the consumer notice must appear before the venue (“State of California, County of …”) of a notarial certificate. If there isn’t enough room between the signature line and the venue, and if you print the consumer notice elsewhere, you will be out of compliance with the law. Also if you forget to print a word, you will be out of compliance with the law. In addition, handwriting the consumer notice into the certificate legibly will take longer than is necessary. Finally, it is up to the party receiving the document (county recorder, filing office, etc.) to determine whether your handwriting is legible. They may choose not to accept it. Since you can’t guarantee that your handwritten consumer notice will be accepted in every case, the NNA recommends that you plan to carry loose certificates that are compliant with the law so that you will not perform an improper notarization or inconvenience a customer. May I have an ink stamp made with the new required wording and affix the new required wording on my old certificates using that stamp? Possibly. As with handwriting the notice, you can use a stamp on your old certificates if there is room. For documents that come with certificate wording, you still can’t guarantee that that there will be enough room between the signature line and the venue to use your stamp with the consumer notice. Finally, any time you use an ink stamp there is the possibility that the impression could smear or fail to print certain words. Even clear ink impressions can smudge by the time they get to the receiving agency. This means the result will be illegible, and you’ll be out of compliance with the law. Because you can’t guarantee with certainty that you’ll be able to use an ink stamp in every case, it is better to have loose certificates with the required wording on hand. Moreover, the cost of new certificates will be comparable to an ink stamp. May I create my own CA certificates instead of purchasing them? Yes you may create your own certificates, but there is one potential issue. If you notarize real property documents that will be sent out of state, your certificate must comply with the state’s recording requirements. Typically, these requirements specify that pages of a recordable document must be of a certain size, contain specified margins on all sides and appear in a specified font size. You’ll have to research recording laws in every state and the District of Columbia to ensure that the certificates you create will be compliant. Certificates purchased through the NNA or downloaded as a member benefit meet the recording requirements in every U.S. state and jurisdiction, so you won’t have to worry about your certificate being rejected. I'm an NNA member. May I download and use the new CA certificates before January 1? Yes, you may download and use the certificates before January 1. Since the new consumer notice appears before the venue of the notarial certificate, technically this wording does not conflict with the requirements for certificates in the law prior to January 1. 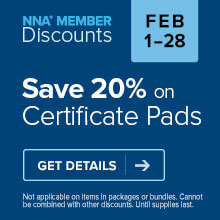 Nonmembers may also obtain certificates with the new CA wording from the NNA. Does the new law require the boxed consumer notice to conform to an exact format, or is there flexibility? The new law contains a provision stating that the physical format of the boxed notice at the top of the certificate shown in the text of the law is given as an example, and is not intended to limit the appearance of the notice to any one format. The only formatting requirements imposed by the new law are that the consumer notice be enclosed in a box and placed at the top of the certificate before the venue. Companies and organizations that create certificates will use formats that meet their needs as long as they also meet the law’s requirements. Certificates produced by the NNA are compliant with the new law and may be used immediately. May I use adhesive labels with the new required consumer notice on my old certificates? Possibly. As with handwriting the notice or using an ink stamp, you can use adhesive labels on your old certificates if there is room and the consumer notice is legible. And there are similar issues. It would be a simple matter to create a label template with the consumer notice and print out sheets of labels as needed. A label would be a better solution than an ink stamp because it would be less likely to smudge. However, the notice wording would still need to be in a box and it must be placed before the venue, just as will any other “improvised” solution. The label would not be compliant if it were placed in the margins or any other location. It also could not cover up any if the wording on the document. Because you will never know if there is enough room on a document to place the label, you will still need to have loose certificates with the consumer disclosure available just in case. Kathy, the new law doesn't technically apply to businesses because they aren't issued Notary commissions. However, on January 1, any Notary who notarizes a document containing the incorrect wording must use a new form. If businesses have California Notaries as employees who regularly notarize business documents, it behooves the business to update their documents with the correct wording to ensure their employee-Notaries comply with the law. Can I begin using the new CA certificates now? Hi Diane, Please see the information addressing this question in the article. Thanks! l foresee most deeds coming from mortgage companies, as not being in compliance. Does the new law provide an exception to the "notice", if it is to be recorded by them out-of-state ? The law has a longstanding provision in Civil Code Section 1189(c) that allows a California Notary to complete an acknowledgment certificate required by another state or jurisdiction of the United States provided the form does not require the notary to determine or certify that the signer holds a particular representative capacity or to make other determinations and certifications not allowed by California law. Am I mistaken? I thought that the notarization wording depends on "where your shoes are" when notarizing. If I notarize a document in California that will be filed in a different state, I will be out of compliance if I use the notarial wording of a different state. Has the law changed also in this regard? Hello Michael, The rules regarding completing out-of-state certificates have not changed. If the document requires an acknowledgment and will be filed in another state or jurisdiction of the United States, a Notary may complete the certificate wording provided the form does not require the Notary to determine or certify that the signer holds a particular representative capacity or to make other determinations and certifications not allowed by California law. If the document requires a jurat or proof of execution, CA Notaries must use the new certificate wording after January 1. I just ordered a new packet of Certificate of Acknowledgement this past year, never used, could I send that back and get a new packet with the new wording? Hi Jessica. I forwarded your message to our Customer Care team. Please contact them at Services@nationalnotary.org or 1-800-876-6827 and they should be able to answer your question after speaking with you. Thanks! Hi Bill. Back when I was actively doing signings (I do one every now and then these days) I used a cert that I made in my computer that exactly emulated the CA language for all signings. I never had any out of state recorders ever reject any notarization with only the CA verbiage. Even when I would get a cert included in the package that did not conform to CA verbiage, I would attach my own cert and never had a problem. Essentially I do not see this as an issue. Howard, Some states have stricter document formatting requirements than others and some recorders are very strict in applying the standards. Given there are 3,600 recording jurisdictions in the U.S. and not knowing that you will be encountering a "rogue" recorder, we're recommending Notaries play it safe. Hello, what if we use the 2014 certificate this month (December) but a county does not record for some reason until January 2015 - would we be out of compliance? This is just another example of why my membership with National Notary Association is so important. I did not know about this new change in the law until I started seeing it mentioned by NNA. I have gone back to the California Secretary of State, Notary Division website several times and there is absolutely no mention of a new form and one is still not posted as of today on the website. I did download the New 2015 Sample Workbook and the new form is reflected in there, but it is not in format which could be easily copied, cut or pasted. It is amazing to me after everything that has happened with the mortgage industry, etc. that the California Secretary of State does not appear to put keeping its notaries informed and up-to-date as a priority. This is definitely not what I would call a good business format. If we execute a document and use a 2014 certificate this month (December) but the county does not record until January 2015, would we be considered out of compliance with state law? I'm perplexed. I received the Notary Consumer Disclosure Requirement (SB 1050) notice yesterday from the San Diego, CA County Recorder. It says the bill requires the new notice to be at the to of the certificate of Acknowledgment IN AN ENCLOSED BOX (emphasized just as a reminder to those who consider creating their own certificates) stating that the acknowledgment, proof of execution, OR JURAT, verifies only the identity of the individual who signed the document to which the Acknowledgment, Proof of Execution or Jurat is attached, and not the truthfulness, accuracy, or validity of the document. Am I correct in understanding that this applies ONLY to Acknowledgments, and not Jurats? My confusion stems from the instructions on the Notice in relation to JURATS - and my understanding that a JURAT IS used to COMPEL TRUTHFULNESS. As part of that notarial act (Jurat), a Notary administers an oath or affirmation to the signer. Suggested prescribed wording for a Jurat Oath (Affirmation) may be "Do you solemnly swear that the statements in this document are true to the best of your knowledge and belief, [so help you God]?" Failure Failing to administer the oath is punishable to CA notaries public. Can you please help alleviate the confusion arising from the instructional wording from the County Clerk's office about the new Disclosure? I am wondering why they included any reference to Jurats and Proofs of Execution if this only applies to Acknowledgments. As always, NNA, thank you so very much for your continued professional expertise and personal support to member notaries public! The bond forms issued by the Calif. Dept. of Transportation includes acknowledgement wording directly on the form. Will the bond forms issued after Jan 1, 2015 include the new wording? Hi Tina, As of January 1, 2015, any acknowledgment wording used in California would need to include the new wording in order to be compliant with state law. I thought this only applied to Acknowledgment certificates. So it applies to ALL of them? Jurats, etc.? Hello Michelle, The new CA law applies to acknowledgment, jurat and proof of execution certificates. Another option that will allow you to make your old Acknowledgement & Jurat forms compliant for 2015 is to create the new verbiage required in a box in a Word Doc that prints at the top of the page within the blank 1 1/2 inch border, then print it on your old forms by running them through your printer again. If you line it up right it will fit nicely at the top of your old forms. I called CA San Bernardino County Clerk's office and they verified by phone that this would be OK. Just wanted to offer another option if you wanted to use your old forms and still look professional. Thank you NNA for keeping us up to date! Notaries can save money by simply adding the new wording above the venue on computer generated certificates. Typing borrower's names clearly and accurately on a certificate in advance can be helpful in preparing loan documents. I like being able to add information like my phone number under the signature line. After over 5,000 signings I have never experienced a rejection. I registered for an October exam to renew my commission that expired in December and I got sent the old forms. Can I exchange the old forms for the new forms or do I have to purchase a new packet? Hi Stephanie. Please contact our Customer Care team at Services@nationalnotary.org or 1-800-876-6827 and they should be able to answer your question after speaking with you. Thanks! Sarah, an adhesive label possibly could be used, but all the caveats we have mentioned in these FAQs to other methods of getting the consumer notice on the acknowledgment apply. Above all, you won't know until you see the document whether there is room to affix an adhesive label, and you don't know if a recorder would possibly reject the document on account of the label. Why doesn't the new wording also include the fact that CA notaries cannot notarize an individual's personal capacity? A lot of banks pre-print the signer's name AND CAPACITY in the acknowledgment section of a notarization form attached to the document being notarized (particularly the Deed)? I called the CA SOS office on Friday regarding SB1050. I wanted to know why their website didn't mention the new law taking effect 1/1/2015 and why they didn't have an example of the new certificates on their website. I was told they have to get it approved thru their legal dept first. The technician stated the new certificates cannot be used prior to 1/1/2015 and their website will be updated soon. I assume the delayed update is to insure no one uses the new wording prior to 1/1/2015. Regarding forms used by attorneys with outdated software programs or forms that say "a notary public" on them...beware. Title and real estate offices that generate their own forms, government agencies and online legal form companies need to be compliant if they expect documents to be recorded in California and avoid being rejected. As notaries ultimately we're responsible for making sure the certificate has the correct wording so carry plenty of certificates with the new wording at all times. I still see Acknowledgments with the wording prior to 2008 "personally known to me." Scary. Hello Wendy, We reached out to the CA Secretary of State's office for confirmation if Notaries may use the new certificate wording before January 1. Please see the response from Nicole Winger, Deputy Secretary of State, Communications, in the article above. I am responding to the NNA response to Catherine L Reeve of 10 Dec 2014. NNA says, "Please note that in California, signers are required by law to present satisfactory evidence of identity to the Notary when a jurat is executed." This response side-steps the question raised by Ms. Reeve. The 2014 edition of the “California Notary Law Primer” (the latest available edition) provides suggested language for the oath as “Do you solemnly swear that the statements made in the affidavit (or deposition) are the truth, the whole truth and nothing but the truth, so help you God?” On Page 36 of the Primer it says “The purpose of a jurat is to compel truthfulness by appealing to the signer’s conscience and fear of criminal penalties for perjury.” It then lists four things that at Notary certifies to when executing a jurat, one of which is that “4) The Notary administered an oath or affirmation to the signer.” On the one hand the notary is confirming that an oath or affirmation was given to (and acknowledged by) the signer (in addition to verifying the identity of the signer by satisfactory evidence, of course), which implies that the signer states and agrees that the document contents are true. On the other hand, the new “in the box” language on the jurat specifically says “A notary public or other officer completing this certificate verifies only the identity of the individual who signed the document to which this certificate is attached, and not the truthfulness, accuracy, or validity of that document”. What would be the point of the jurat if not to reinforce truthfulness? Perhaps the language should be modified to something like: “A notary public or other officer completing this certificate verifies only (a) the identity of the individual who signed the document to which this certificate is attached, and (b) that an oath or affirmation was given to (and acknowledged by) the signer, and not the truthfulness, accuracy, or validity of that document.” Just sayin' . . .
Is it ok to include the new wording in the POA Acknowledgement form to be signed in December, 2014, but to be actually used in 2015? Hello Howard. Please see the response from the Secretary of State's office above regarding use of the new notarial certificate language prior to Jan. 1, 2015. Thanks! Does this change also affect California Copy Certification by Document Custodian form? Hello Doris, The new law change applies to certificates for acknowledgments, jurats and proofs of execution. Question: How does this new certificate disclaimer wording apply to a situation where a document was notarized in October 2014 (using the old 2014 compliant certificate), but is not being filed until January 2015. Will it be "out of compliance"? Thanks! Hello Galen, If the document was notarized in 2014, then it would have been acceptable at that time to use the previous CA wording. However, the signer may wish to contact the agency receiving the document to ask if the receiving agency would have any issues accepting a document notarized last year. Does this law affect notaries in other states? When notarizing a document in NM that may be recorded in CA, must I comply with the CA wording or continue to use what is acceptable in NM? Hello, Notaries in states outside of California should always use certificate wording that is compliant with their own state's laws. So this new certificate only applies to docs filed in California? Out of state are exempt? Also, some pension benefits forms for California specifically state "no other acknowledgment will be accepted." Do I just attach a new one anyway? Hello Carmen, The new law applies to every acknowledgment certificate attached to or included on a document to be filed in the state of California, jurat certificate and proof of execution certificate. Any notarial certificate used that falls under these categories must include the new wording. Do I need to use a loose certificate with new wording on the preprinted document containing notarial content, such as DMV Lien Satified document? Hi June, Yes, if as a California Notary you encounter a lien release form that does not have the consumer notice, you must use a certificate that complies with the new requirements. If I receive a document notarized in 2015 and it doesn't contain the box and verbiage can I stamp it on the document or does it have to be done by the notary? Hello Lisa, If an error is discovered in a notarization after the act is completed, the California Secretary of State's office has stated in its January 2014 newsletter that a new notarization will need to be performed. You would need to bring the original notarized document back to the Notary in order to perform a new notarization with the correct wording. Say I have an attachment to a deed with 3 acknowledgements for 3 different signers...can I simply print one of the new box of info at the top of the page, or does the new wording need to be printed above each of the 3 acks? It seems redundant, yet the new wording is part of the ack, so i'd rather "overkill" and be safe. Rose, in the scenario you present, each acknowledgment would have to have its own consumer notice because any acknowledgment completed after January 1, 2015 by a California Notary on a document to be filed in the state of California must have all of the required wording in the statute. I am aware that The new CA law applies to acknowledgment, jurat and proof of execution certificates however isn't a Copy Certification by Document Custodian include a Jurat? My question would be is do I have to update my California Copy Certification by Document Custodian forms? Hello Cindy, The new mandatory wording would need to be included above any jurat certificate wording you completed for a copy certification by document custodian. The written statement that the document custodian is swearing or attesting to is separate from the notarial certificate wording. My question is: I have an out of state document that needs to be notarized stating that the person in the photograph and the signature and verified ID (passport) is me. The California notary refuses to notarize my document no matter what. The document is pretty straightforward and I don't see what the problem is. I think the notary is misinterpreting the new law. Julia, without actually seeing the document and examining the notarial wording, I can't say for sure, but the Notary could be refusing to notarize your document because it requires the Notary to make a certification he or she cannot make. Generally, California Notaries cannot certify under their official seals that a person is the same person in a photograph. They can only take acknowledgments and documents signed under oath in their presence. The photograph was taken in their store by them. (The UPS Store). We have had the same type of document notarized many times in the past without a problem. It is one page which will be included with an application for credentialing purposes with an out of state hospital. The hospital does not require the other documents to be notarize. The just want to make sure I am who I say I am. I am a California Notary trying to comply with the new CA Cerificate Law. We had interpreted this law to mean any document notarized for recordation in the state of CA. However, we have two (2) clients notifying us that in order to be in compliance, they require all documents notorized in the State of California, regardless of the property location, include the new language box. Does this apply to all docs notarized by a CA notary - or, if it is a doc to be recorded in another state, does the law apply? Hello, If the document requires an acknowledgment and will be filed in another state or jurisdiction of the United States, a Notary may complete the certificate wording provided the form does not require the Notary to determine or certify that the signer holds a particular representative capacity or to make other determinations and certifications not allowed by California law. If the document requires a jurat or proof of execution, CA Notaries must use the new certificate wording after January 1. I have a doc that is being filed out of state and has its own acknowledgment, do I still need to attach a new CA form? Also, what's the point in taking an oath for a jurat if the new notice disclaims the truthfulness of the document? Hello Carmen, The rules in CA regarding completing out-of-state certificates have not changed. If the document requires an acknowledgment and will be filed in another state or jurisdiction of the United States, a Notary may complete the certificate wording provided the form does not require the Notary to determine or certify that the signer holds a particular representative capacity or to make other determinations and certifications not allowed by California law. If the document requires a jurat or proof of execution, CA Notaries must use the new certificate wording after January 1. I just re-read the text of the new law. In part it says, "Any certificate of acknowledgment taken within this state shall include a notice at the top of the certificate of acknowledgment in an enclosed box..." The way this is worded suggests that the notice must be on EVERY acknowledgment or jurat regardless of whether it will be staying in California, since it says every acknowledgment TAKEN in the state not FILED in the state. Am I reading this correctly? Hello Sandra, The rules in CA regarding completing out-of-state certificates have not changed. If the document requires an acknowledgment and will be filed in another state or jurisdiction of the United States, a Notary may complete the certificate wording provided the form does not require the Notary to determine or certify that the signer holds a particular representative capacity or to make other determinations and certifications not allowed by California law. However, If the document requires a jurat or proof of execution, CA Notaries must use the new certificate wording after January 1. When a bank supplies loan documents with notarization paperwork attached that does not have the new certificate wording, do you replace it with the new forms without a problem of it being rejected? Hello Monica, California law requires use of the new wording for appropriate notarial acts. If you encounter a document that does not include the required certificate wording you should contact the bank for instructions on how to have the wording corrected. I am not sure why this needs so much discussion. As a California notary, we should comply with California laws for our forms, regardless of whether they are going out of state or not. If the forms going out have extra wording on them, so what - all of our bases are still covered. I have a document, a Distribution Election Form that needs the spouses signature notarized. Ii includes the old wording and place to stamp...I have the new Acknowledgments to fill out, do I leave the area included in the document blank? Or? My corporate legal department creates their own "Waivers" (CCC 8132, 8134, 8136 & 8138) that combine the lien waiver requirements along with the notorial wording at the bottom of the form. They put the new disclaimer at the top of the Acknowledgment section of the waiver. However, it appears to the side (beside rather than above) of the venue. I argue that this is incorrect but they refuse to change the document and insist I use this form and have my subcontractors use this form as well. Is their version acceptable or not? Hello Bonnie, To help us answer your question, would it be possible for us to review a copy of the document you are describing? You can fax a copy to 818-739-4056, attention: Communications Department, David Thun, or email a copy to social@nationalnotary.org. What is the maximum fee amount I can charge for each notarial signature for the State of California? 1. Notarizing a signature, either by acknowledgment,proof or jurat: $10 per signature of principal (GC 8211[a] and [b]); 2. Administering an oath or affirmation, apart from a jurat: $10 per person (GC 8211[b]); 3. For all services rendered in connection with taking a deposition: $20, plus $5 for the oath and $5 for the certificate (GC 8211[c]); 4. For certifying a copy of a power of attorney, $10 (GC 8211[e]); 5, For a photocopy of a journal entry: $0.30 per page (GC 8206[c]).